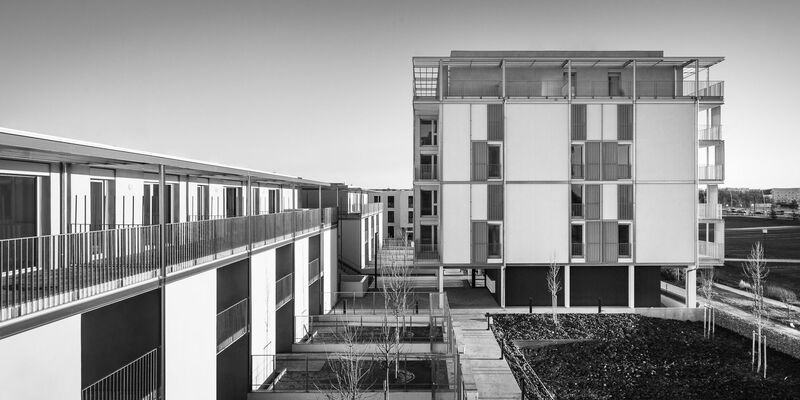 The project is located at the north end of the ZAC Androméde, next to the Toulouse Airport and with its west façade overlooking the “Cours Barricou”, natural axis of the ZAC. To the east, Vignemale St. marks the transition with the urban scale of the village, and defines the resulting 40m wide and 180 long plot. The project is divided in two phases, the first one delivered in February 2016. 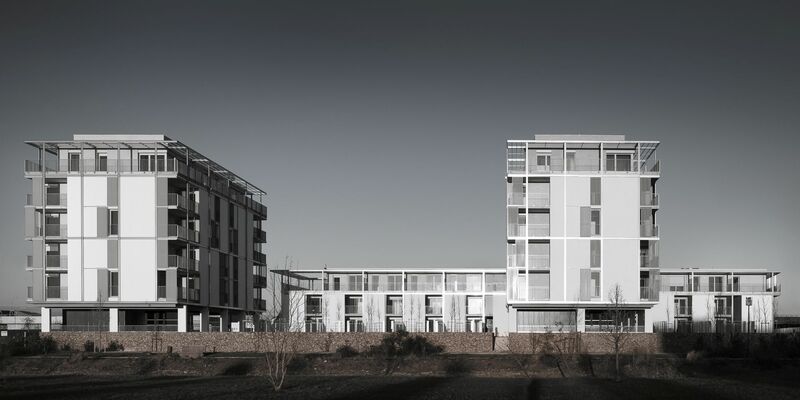 The mixed character of the northwest landscape of Toulouse, calls for a double-scale design strategy, responding both to the large landscape and to a more urban layout. 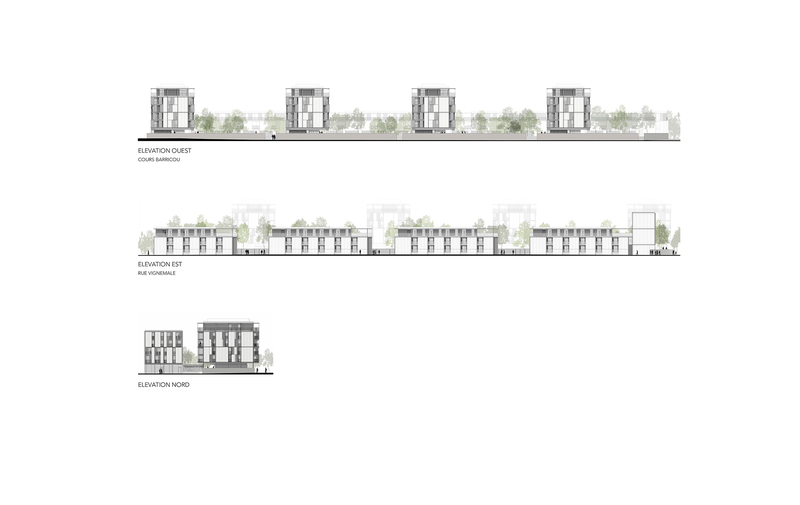 The placement of four 5-storey blocks overlooking the Cours Barricou emphasizes the East-West transversal direction and divides the lot into 4 subsets, while providing a response to the far views provided by the “cours” extension. 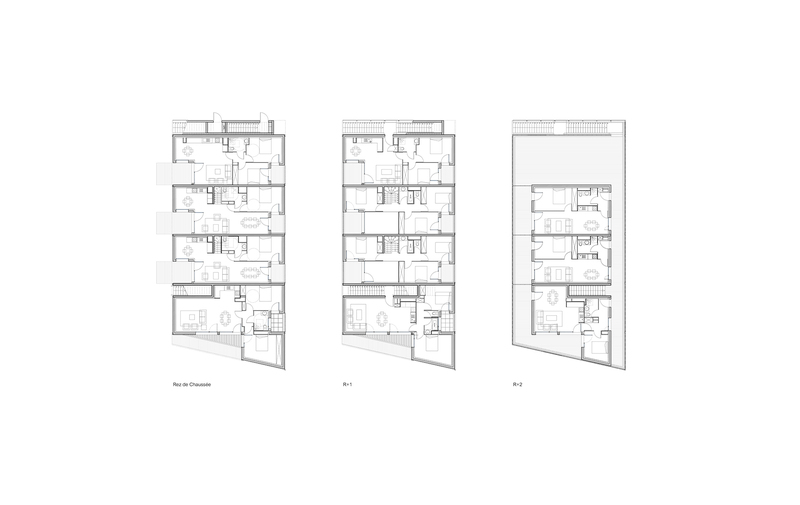 On the opposite direction, four mid-scale pieces are located alongside the Vignemale street, providing privacy to the interior courts, transition places between public and private spaces, while orienting them to the South-West, the privileged view. 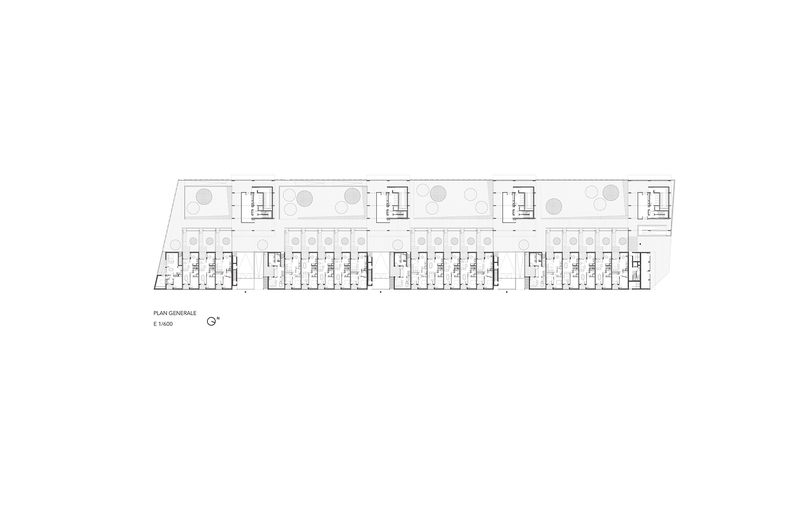 The simplicity of the proposed volumes and their layout respond to the variable and dynamic typologies and emphasizes the starting-point/end-point character of the #56 block. The general layout tends towards the optimization of solar orientation and distances between volumes. 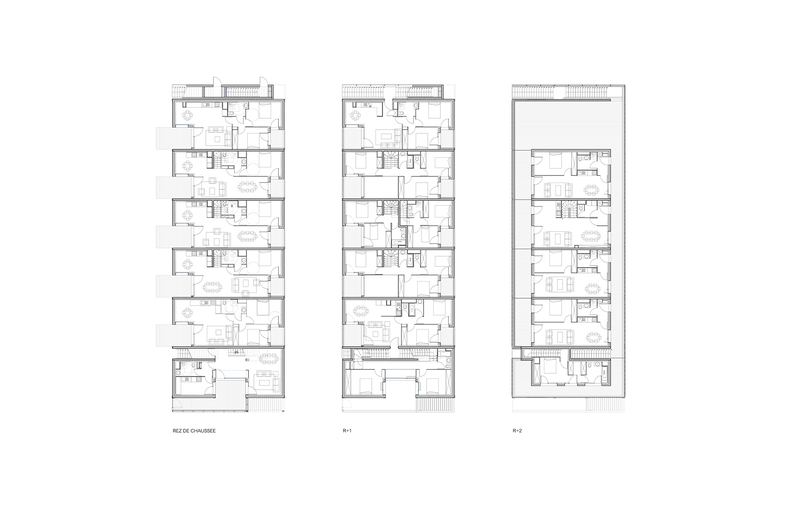 The independent volumes, different in internal distribution, seek the best possible qualities for the dwellings, mostly facing South/Southeast and pursuing the best views : towers of apartments with terraces and in-between volumes with yard houses and duplexes. A thorough work of demateralization of the prismatic volumes was done by means of cutouts, corner treatment, lower and top elements, and any sort of limit. 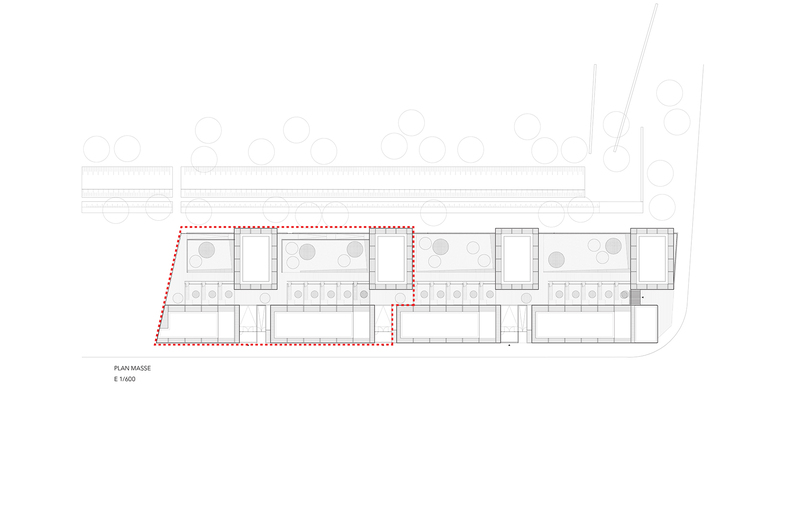 The unbuilt spaces play a role in this simplicity, they are arranged forming small courts and gardens directly accessible from the Street, and connected by a pedestrian longitudinal axis. The modular organization of plans and facades facilitates a rational construction system which also responds to the different scales. 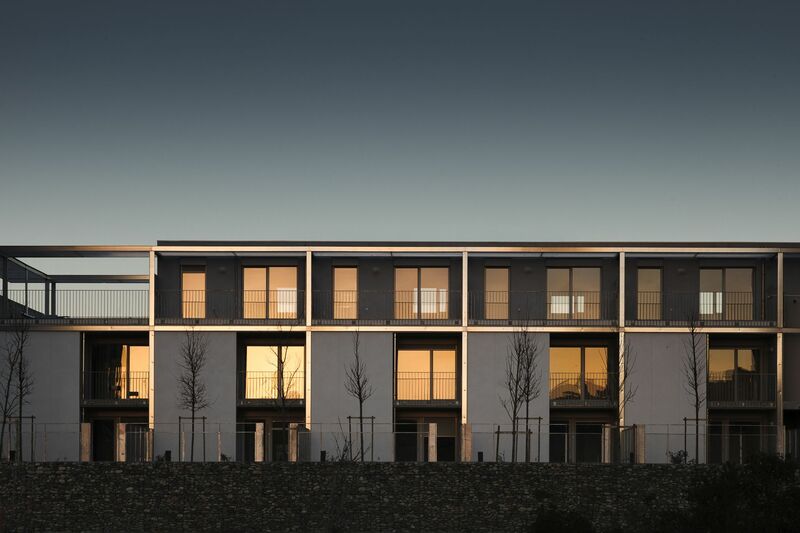 The modular layout of structure and metalwork conform the distant view composition, while the rest of the façade, a simple façade coating, constitutes a neutral and unobtrusive backdrop. 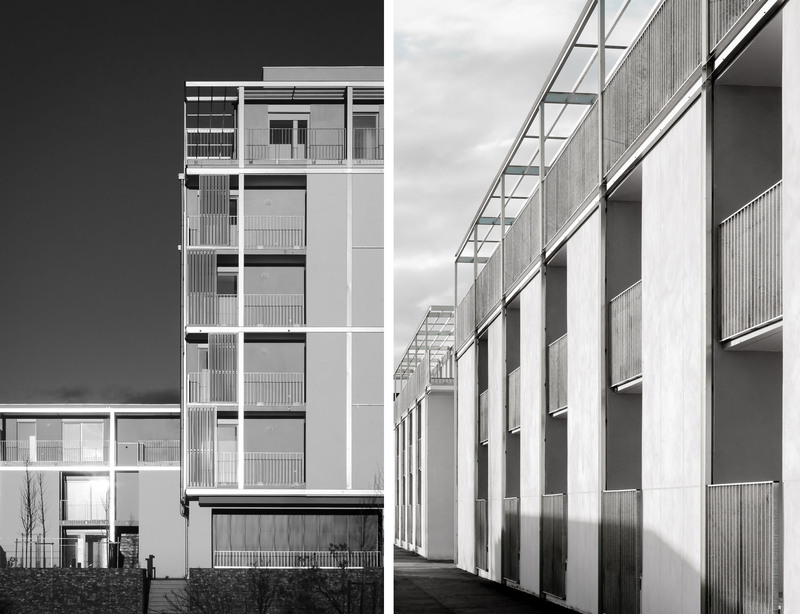 These modules, composed of galvanized profiles and ´metalwork, sliding aluminum louvers, provide a certain flexibility and diversity to the façades. 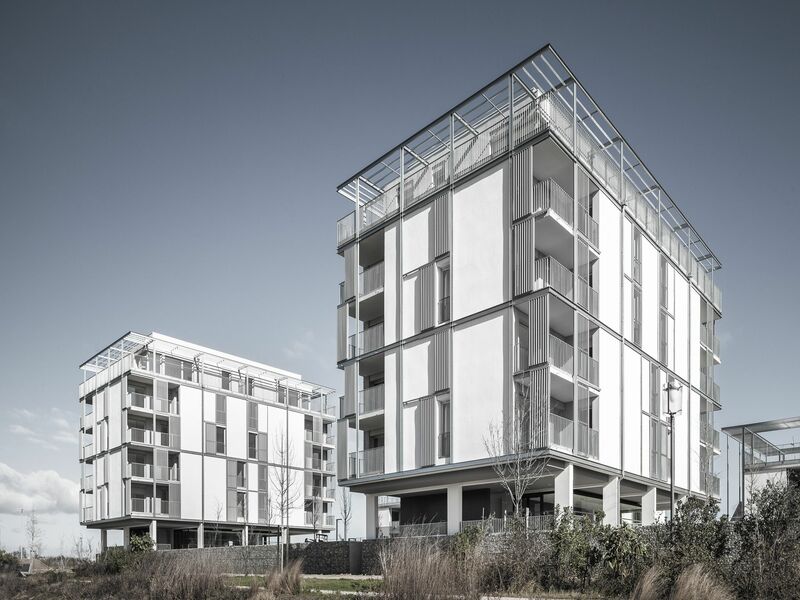 The combination of modules allows for a double storey façade composition. The interplay that occurs between fixed and movable elements, solid and hollow ones, with numerous grouping mechanism for the openings, contributes to the general dynamics of the façade and its double –near/far- reading. Formal sobriety reappears in the stated intention to work on compacity in order to minimize losses. 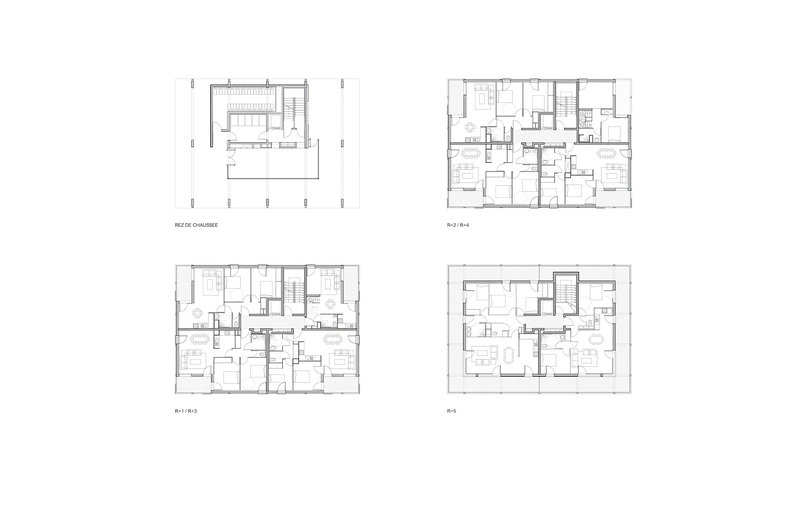 The double orientation of the houses enables natural cross-ventilation and maximum sunlight exposure. Intermediate spaces such as loggias, terraces, lattices and gardens complete the filtering mechanisms. These mechanisms guarantee a passive environmental approach complemented by active energy management systems, and rainwater recovery which is used for garden irrigation, thanks to the green roofs. Particular attention is paid to the treatment of exterior spaces, and specifically the layout of large elements planted in the gardens, providing the areas more exposed to the sun with adiabatic ventilation and shading during warmer periods. The quality of landscape design is emphasized with evergreens. This approach is found both in the large pleine terre gardens that incorporate rainwater recovery elements, and in the private gardens, with small trees that work as a solar filter for western sun exposure.